VATICAN CITY (CNS) — Urging Catholics to “pick up the Bible” and read it during the Year of Faith, Pope Benedict XVI said the Scriptures recount the story of God’s love for humanity and the steps he took throughout history to save all men and women. “That which enlightens and gives full meaning to the history of the world and of the human person began to shine in the grotto of Bethlehem. It is the mystery we soon will contemplate at Christmas: our salvation in Jesus Christ,” the pope said Dec. 12 during his weekly general audience. 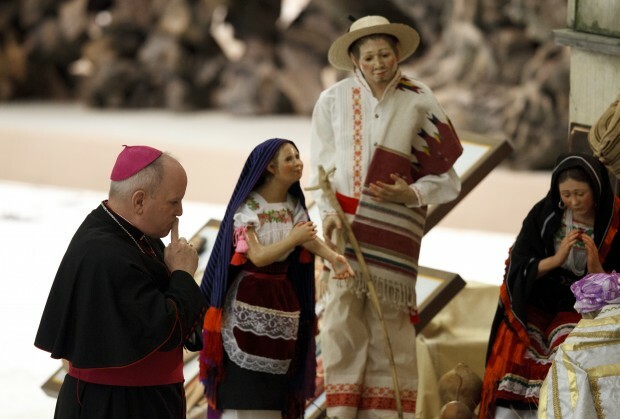 A 100-member delegation from the Mexican state of Michoacan was among the 4,500 visitors and pilgrims at the audience; artists and craftspeople in the state created the Nativity scene already decorating the stage of the audience hall. With the audience being held on the feast of Our Lady of Guadalupe, the Michoacan delegates and others waved banners with the famous image. Also present were cardinals, bishops, priests and laypeople from North, South and Central America who were celebrating the Guadalupe feast day during in a Vatican congress marking the 15th anniversary of the Synod of Bishops for America. Pope Benedict said the word “advent,” which means “coming” or “presence,” in ancient times was used to refer to the official visit of the king or emperor to a certain province. From the creation of the world to Noah and the flood, from the call of Abraham to the giving of the law on Mount Sinai, the Bible is the story of how God repeatedly has acted in history to demonstrate his presence, his love for humanity and his desire to save all men and women, Pope Benedict said. “Advent calls us to recall the history of his presence and always remember that God did not cut himself off from the world, he isn’t absent and he does not abandon us,” but “he comes to meet us in the different ways, which we must learn to discern,” the pope said. “And we, with our faith, hope and charity, are called each day to recognize and give witness to his presence in a world that is often superficial and distracted,” he said. The role of Christians today, he said, is to make sure that “the light that lit up the manger in Bethlehem” shines through their lives.